Jess's Rec: I've long been a fan of Porcellino's simple, zen-like illustration and intimate storytelling. His latest book is no exception-- I felt transported and transfixed to John's personal journey through hospital diagnoses, personal crises, and anxiety. 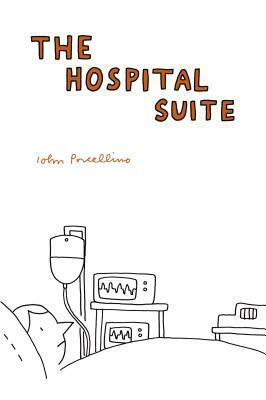 The Hospital Suite is a landmark work by the celebrated cartoonist and small-press legend John Porcellino—an autobiographical collection detailing his struggles with illness in the 1990s and early 2000s. In 1997, John began to have severe stomach pain. He soon found out he needed emergency surgery to remove a benign tumor from his small intestine. In the wake of the surgery, he had numerous health complications that led to a flare-up of his preexisting tendencies toward anxiety and obsessive-compulsive disorder. The Hospital Suite is Porcellino's response to these experiences—simply told stories drawn in the honest, heart-wrenching style of his much-loved King-Cat mini-comics. His gift for spare yet eloquent candor makes The Hospital Suite an intimate portrayal of one person's experiences that is also intensely relatable. Porcellino's work is lauded for its universality and quiet, clear-eyed contemplation of everyday life. The Hospital Suite is a testimony to this subtle strength, making his struggles with the medical system and its consequences for his mental health accessible and engaging. John Porcellino was born in Chicago, Illinois, in 1968, and began drawing and writing at an early age, compiling his work into handmade booklets. His acclaimed self-published zine, King-Cat Comics and Stories, begun in 1989, has found a devoted worldwide audience, and is one of the most influential comics series of the past twenty-five years.